Kelly M. Walne was born and raised in Houston, Texas. After graduating from The Kinkaid School as a Commended National Merit Scholar and four-year letterman, Kelly went on to double-major at the University of Texas at Austin, where he was Chairman of the Student Events Center Board. Thereafter, he attended South Texas College of Law, where he was a Dean’s Scholar, named to the Dean’s List, received multiple AmJur awards for excellence in the classroom and, ultimately, participated in the school’s esteemed Moot Court advocacy program. As a brief writer, Kelly won multiple Best Brief awards at both state and national competitions, including Second Best Brief at the Moot Court National Championship. After graduating near the top of his class, Kelly went to work for a large Houston firm, where he joined the firm’s Technical Litigation Group, which primarily handled the firm’s most complex commercial litigation matters. 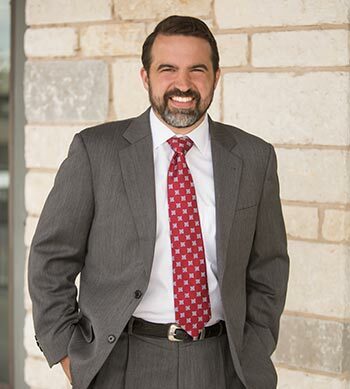 For a number of years, Kelly gained invaluable experience aggressively representing corporate clients in what could only be called “high-stakes” litigation, practicing alongside some of the best firms and attorneys in the State of Texas, if not the nation; however, Kelly is a full-time father before he is a lawyer. As a result, in October 2015, he decided to relocate his practice to Marble Falls, and in doing so, Kelly and his son, Jackson, were not only able to get out of the Houston routine of rushed breakfasts and miles of traffic, but Kelly could also start doing what he loves most—zealously advocating on behalf of individuals, and their families, against big corporations and insurance companies.